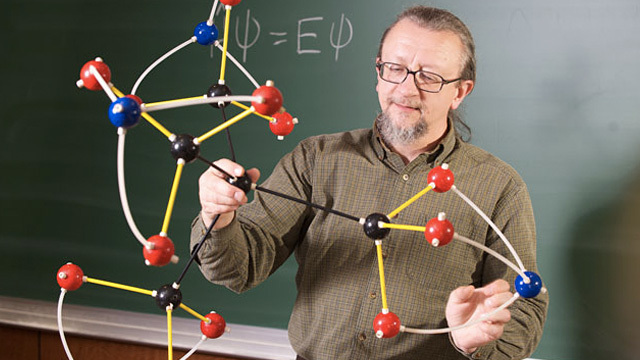 Professor Robert Zoellner of Humboldt State University confirmed the discovery of a new molecule. Kenneth Boehr gave his fifth grade class some molecule modeling kits to, you know, build molecule models. Maybe he wanted a chance to catch up on Facebook and thought this would kill some time and keep the kids out of his hair for a while. Whatever the reason, he certainly didn't expect one of his pupils to make an explosive discovery. The future chemist (or homeland security threat) is 10-year-old Clara Lazen. She wasn't out to do anything groundbreaking. She just threw together some oxygen, nitrogen, and carbon atoms into a random arrangement and, voilà!, scientific history was made. The heretofore unknown molecule, hereafter known as tetranitratoxycarbon, contains the same combination of atoms as nitroglycerin. That means if a chemist could create an actual tetranitratoxycarbon molecule, it could do something useful, like store energy, or do something really cool, like blow something up. Zoellner has since published an article about the molecule. Clara and her teacher are both listed as co-authors.